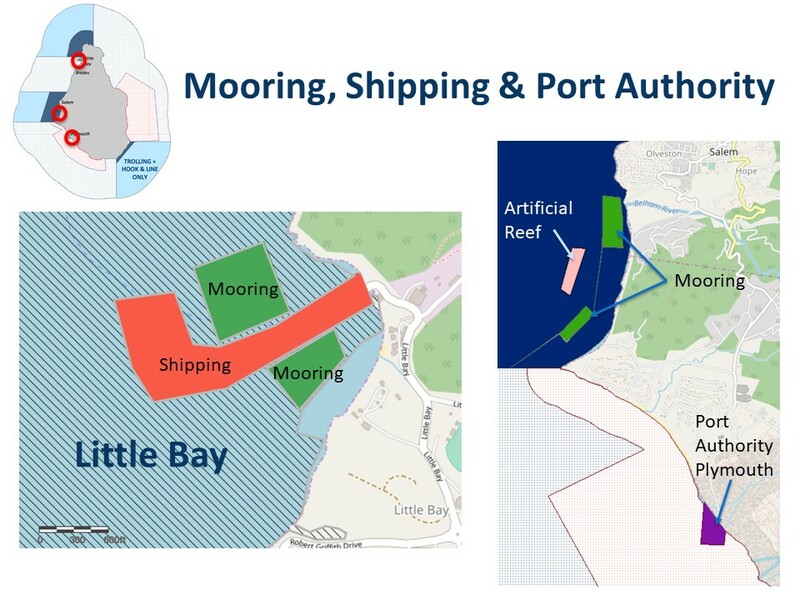 In 2015, the Government of Montserrat committed to “a science-driven and community-led marine spatial planning process to foster the sustainable, profitable, and enjoyable use of ocean resources for present and future generations.” Now in 2018, the marine spatial plan is out for public consultation but it falls short of the original goals. In partnership with Ted Waitt and The Waitt Institute, the Blue Halo Montserrat project was launched in 2015. The intent was not only to educate, but to champion the communities to collaborate with the government on a plan to preserve the marine resources by demarkating areas for various uses. 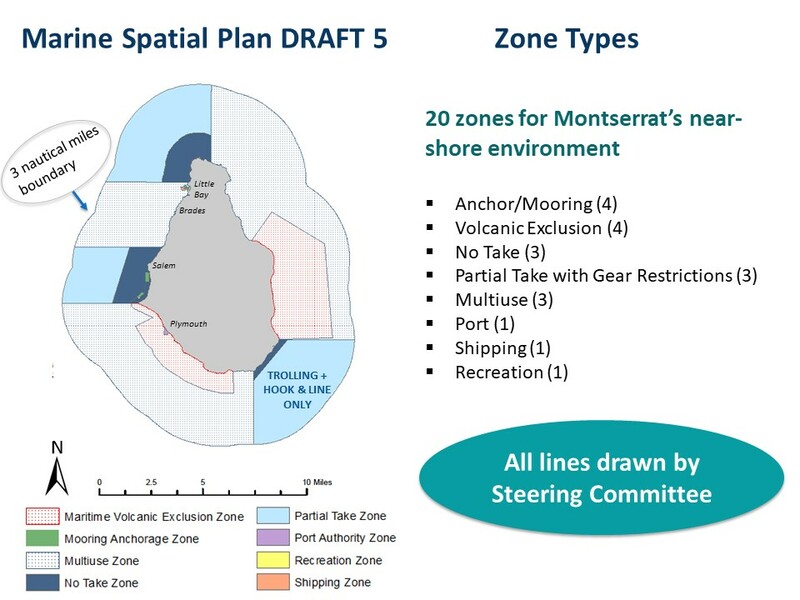 Waitt’s goal was at minimum a 30% No-Take zone in Montserrat’s waters. 30% is the minimum scientists believe is needed for fish stocks, corals and other sea life to flourish and replenish themselves from overfishing. 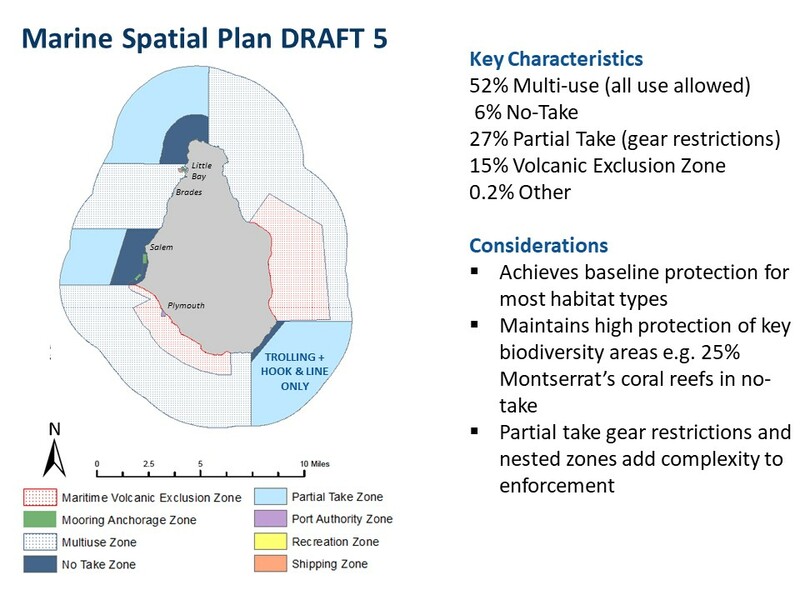 The UN documents on Montserrat’s agreement to the Conservation Goals state “through the marine spatial planning process and in accordance with Aichi Target 11, the Government of Montserrat commits to protecting 10% to 30% of its marine environment as a no-take marine reserve.” The current plan has allocated only 6% as No-Take. Robin Ramdeen, the Blue Halo Montserrat & Barbuda Manager said the current plan is the result of the input of three years of consultations amounting to more than 120 interviews with fishers and divers, 127 community surveys, and six public consultations. The feedback was then used by the Steering Committee, led by Director of Agriculture Melissa O’Garro, and other stakeholders to design the MSP. On Tuesday morning, stakeholders were able to see Draft 5 of the Marine Spatial Plan now on its second round of consultations. The plan outlines the zones created around the island with only 6% designated as No-Take. Meaning in these dark blue areas, no fishing of the commercial or recreational kind, is allowed. 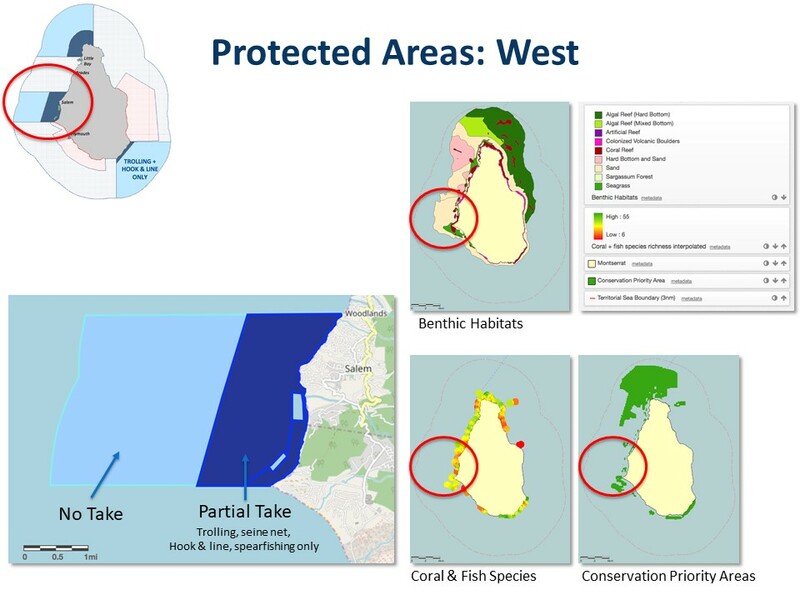 During the discussion, attendees questioned the reasons for the low No-Take area, considering it had already been emphasized that a 30% No-Take would help to better replenish and protect the ocean resources. 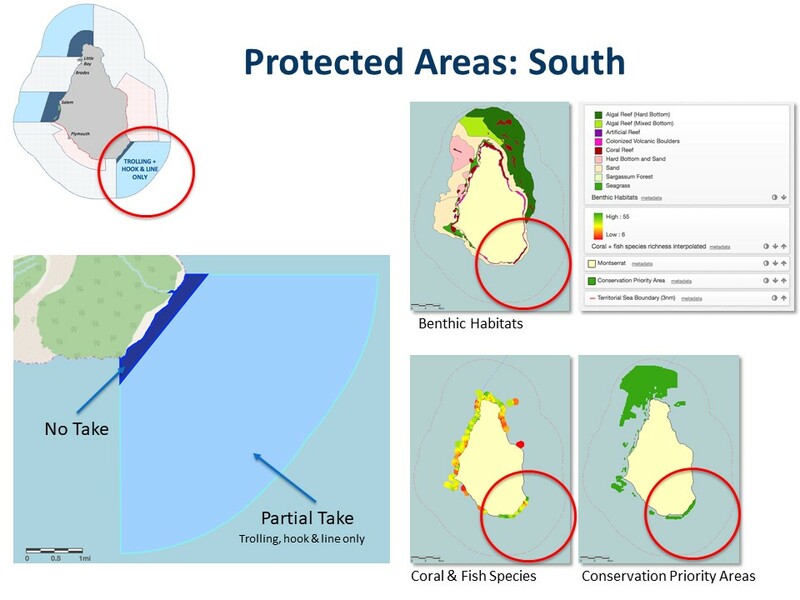 Ramdeen shared, that the fishers had challenged the original plan of making the Northern and NorthEastern coastline, which also has 75% of the island’s coral reefs No-Take zones. This is the area that they primarily fish and felt their businesses would suffer as a result of discontinuing access. The area of most contention Ramdeen said, was the Little Bay which is a multi-use area. The Port Authority contributed to the zoning of the area, which included a concept for the proposed breakwater. 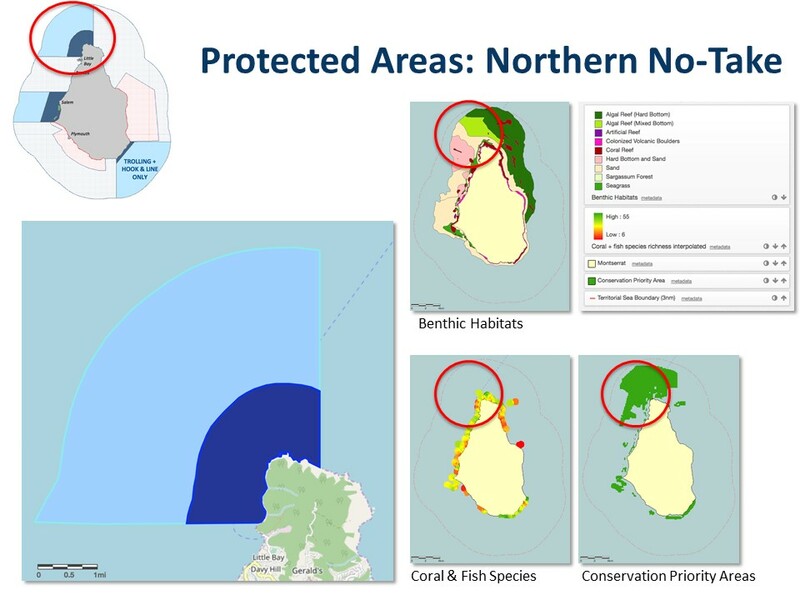 There are 20 zones for Montserrat’s near-shore environment with the bumper currently set at three nautical miles. There is intention in years to come to expand it to 12 nautical miles. On the images included, the light blue areas are the Partial Take zones (trolling and hook & line permitted) and dark blue the No-Take zones. White is business as usual. In this current iteration of the MSP Partial Take zones take up 27%, 52% multi-use, 15% volcano exclusion zone and 0.2% other. Ramdeen said she is happy that 25% of Montserrat’s coral reefs are now protected. She added that boundaries will need to be clearly marked so everyone understands the zones and the marine unit can enforce them. Department of Environment Information Officer Stephen Mendes said sacrifices may be made in the development of the current draft plan. Residents may no longer be able to shoreline fish from Isles Bay or Old Road Bay as these are being suggested as No-Take areas. Former Minister of Agriculture Claude Hogan, said he still believes Montserrat can get more than 30% of the surrounding waters in its No-Take Zones. However, to do this, the ministry and the government as a whole needs to invest in improving the capacity of the fishermen to enable them to go out further and stay out longer to fish in waters outside of the restricted areas. In its UN agrrement, the Government also committed to implementing a new fisheries management framework to restore fish stocks and develop a sustainable FAD fishery for offshore pelagic species. Furthermore, Montserrat was to develop a Montserrat Ocean Trust through the existing Montserrat National Trust system to support the sustainable financing of ocean management, research, education and capacity building. Ramdeen shared that the fund has now been established with the National Trust and will be used to continue the project once Blue Halo’s work is completed. Recent meetings on island of regional fisheries ministers underscored the fact that overfishing continues to be a challenge for the Caribbean and that the impact on marine biodiversity and the ecosystems is great. No-Take marine reserves have been proposed by scientists and international agencies as one of the most successful management tools to reverse these degradation trends. Along, with creating a safe place for fish to rebound, it also protects the growth of coral reefs and the natural marine habitat. These habitats are what allow islands’ to offer tourism products which include diving and snorkeling and healthy oceans to swim in. In its current state, the island will not be able to see its fish, coral and marine ecosystem rebound, it will also lose access to international donor support coming on stream for nations who are investing in the Blue Economy as it is well below the target of 30% or even the minimum it identified as 10%. In years to come, the fishermen will suffer as they will deplete the fish stocks. The fishers will have one more opportunity to weigh in the marine spatial plan next Monday, before the Steering Committee makes its final changes. It is hoped that by the end of 2018, Montserrat will have a completed MSP with the attached laws awaiting enactment.